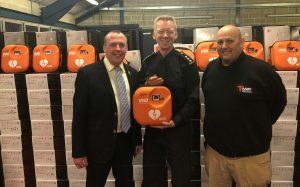 Paul Watts (left), Head of International Business Development at SP Services, with resuscitation expert Stephen Furnell and Border Force Senior Officer Neil Dangerfield. Defibrillators are being put into Border Force sites with more than 20 staff in a groundbreaking move to improve the survival of anyone having a cardiac arrest. Survival rates fall from between seven to 10 percent for each minute a defibrillator (AED) is not used, says resuscitation expert Stephen Furnell, who has been campaigning for more than 20 years for the devices at public sites and workplaces. “Every second counts when someone collapses and stops breathing. These devices are simple to use by anyone with little or no training. The sooner it is used in a collapse, the better the chances of a positive outcome,” adds Stephen, of the Resuscitation and Medical Consultancy, which advises Border Force. The extra 110 defibrillators, delivered by medical supplier SP Services, will add to Border Force’s existing AEDs, which were installed into custody areas in 2012. Border Force Senior Officer Neil Dangerfield said, “Our decision to install AEDs in Border Force workplaces, including some smaller ports and offices, was taken with our wider workforce in mind but many of these areas are also spaces that the public and other workers pass through.